LIC’s Navjeevan Plan 853 -Details with Premium Maturity Benefit and Insurance coverage calculators. LIC has introduced Navjeevan (853) – a new non-linked, with profit endowment assurance plan with effect from 18th March 2019. Navjeevan which means ‘New life’ is available in two premium modes. If you are viewing this post from a mobile phone please click here to load a non-amp version of the post. So that you can view all charts and illustrations in this post. 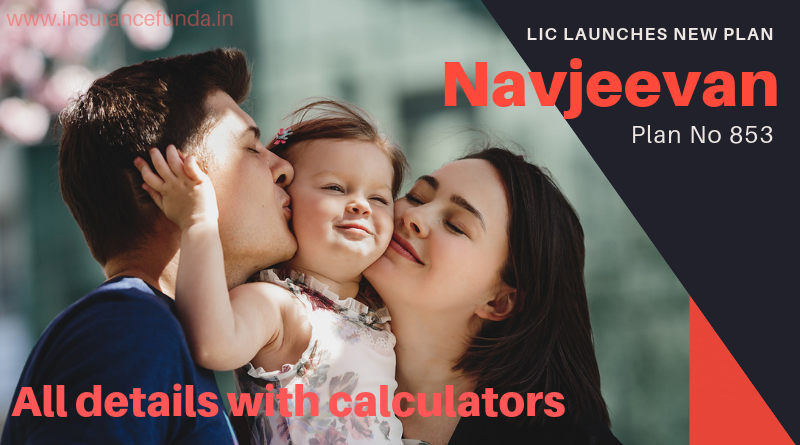 LIC’s Navjeevan plan 853 – Premium and benefit calculator. LIC’s Navjeevan Plan 853 – Maturity benefits. Navjeevan – How much returns you can expect? Sum Assured at Death – What does it mean? The term of the plan available is 10 to 18 years. Premium paying term single or five years. For Single payment mode, absolute death sum assured shall be 10 times of tabular single premium for the chosen basic sum assured. 7 times of annualized premium. If the person is below 45 years of age absolute death sum assured shall be 10 times of annualized premium. Online premium and benefit calculator of LIC’s Navjeevan plan 853 is intended to help you to understand all the benefits of the plan easily. It can help you to calculate premium payable for various modes and get the benefits such as insurance coverage, Maturity Benefit, Tax benefits etc. If you are unable to view the calculator properly Click here to open Navjeevan calculator in a separate page. On the life assured surviving to the end of the policy term, (Provided all due premiums have been paid) Basic sum assured + Loyalty addition (if any) shall be payable. In single premium as well as limited payment policy the maturity benefit shall be Sum assured + loyalty addition. Policies shall be eligible for declared loyalty additions at the time of exit by way of maturity or death, provided the premium has been paid for at least five policy years and five years have been completed at the time of exit. Declared loyalty additions will be considered in the surrender value calculations of both single as well as limited premium payment plan also, provided, five full-year premium has been paid. As LIC of India has not declared Loyalty Addition rates we will not be able to accurately predict the maturity value of Nav Jeevan plan. But there is a way to reasonably predict the loyalty addition rates. Benefit illustrations provided by LIC can throw light on the possible loyalty addition rates. LIC of India provides benefit illustrations at 8% gross investment returns scenario as per the IRDA instructions. If we analyze the benefit illustrations of LIC plans we can understand that most of the plans offer bonus rates higher than 8% scenario. You can use the calculator provided above to get the indicative matuiry benefit using 8% gross investment scenario. If the age at entry of the life assured is less than 8 years, the risk will commence either one day before the completion of 2 years or one day before the policy anniversary coming after the completion of 8 years of age whichever is earlier. In case of in force policies where death of the life assured occurs before the maturity date, following death benefits shall become payable. Sum Assured at death + loyalty addition applicable shall become payable. LIC’s Navjeevan plan has some unique features which can be useful at times. Let us have a detailed look. Navjeevan Plan offers a minimum insurance coverage of 10 times the premium paid. This is highly advantageous for getting income tax rebates under section 80C. Both Single, as well as regular premium plan, can be used for income tax purpose. In order to get income tax rebate the premium paid in a financial year for a plan should not exceed 20% of the Sum Assured of it. Normally single premium plans do not have Accident benefit Rider option. But LIC is offering this benefit for the first time with Navjeevan plan. Incidentally, the limited premium payment option of Navjeevan also offers accident and disability rider. So by just paying accident benefit premium for 5 years accident coverage up to 18 years can be availed. LIC of India generally offers plans with age at entry is restricted up to the age of 50 or 55 years. Even the basic endowment assurance plan can be taken only up to the age of 55 Years. It is great to get a minimum coverage of 7 times of the premium paid (Under Option 2) for a 65 age old person. On the other hand a sixty year person can avail a coverage up to 10 times the premium paid. Settlement option available for maturity amount can make Navjeevan a pension plan to some extent. Maximum settlement period available is 15 years. When you opt for settlement option with monthly mode the maturity amount shall be available as an annuity for a period up to 15 years. As the settled maturity amount is tax free under section 10 (10D ) of income tax act, unlike other pension plans where annuity is taxable, Navjeevan offers tax free pension. Let us have a look at the riders and options available under the plan. This rider can be opted only at the time of inception of the plan. If this rider is opted for, in case accidental death of life assured, accidental death sum assured is paid along with the death benefit as a single lump sum payment. In case of accidental disability arising due to an accident (within 180 days from the date of accident) an amount equal to the accident benefit sum assured will be paid in monthly installment spread over 10 years and the future premiums for the rider as well as premiums for that portion of sum assured shall be waived. Settlement option can be used to receive the maturity benefit or death benefit in installments over a chosen period of 5 or 10 or 15 years instead of lump sum amount. Whole maturity amount or a part of it can be used for settlement option. The interest rates applicable for arriving at the installment payments under settlement option shall be fixed by the corporation from time to time. Settlement option is available in Yearly, Half yearly, Quarterly or Monthly mode subject to the minimum settled amount of 50000, 25000, 15000 and 5000 for respective modes. Commutation is available any time after the settlement option has been executed and this adds to the flexibility of the settlement option. The amount available shall be ‘discounted value of all future installments due‘ or ‘The original amount for settlement option was exercised‘ less ‘Sum of total installment already paid‘. Click the links given below to download the proposal form for LIC’s Navjeevan -Plan 853. For more details refer to LIC of India web site.